A safari in the Serengeti is unlike any other wildlife experience on earth. When you come to Tanzania to see some of Africa’s best animals you want to make sure you dress the part. After all, I doubt anyone wants to experience the wildebeest migration wearing a winter coat or sunburnt because they forgot the perfect safari hat. 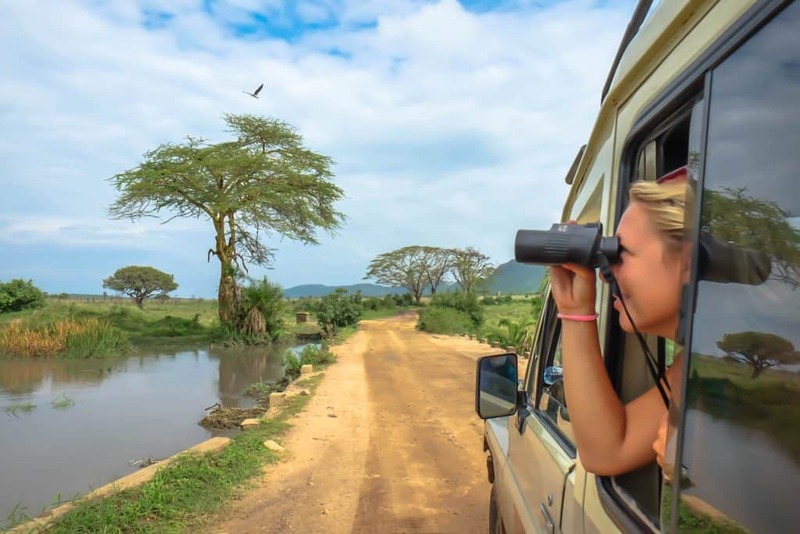 That means you should grab everything you can from this Serengeti safari packing checklist. This will help with everything from clothes, to electronics, the perfect safari camera, and even safari boots. So, get ready to dig in and be on the lookout for the big five and more! The Shorts: Depending on the season it can get scorching hot in the Serengeti. Make sure you don’t get caught in a safari vehicle with no escape from the heat. I have a great pair of convertible pants like these for when I go through hot or cold flashes. They are perfect for ever changing climates. However, I have to admit that they are not for the fashion models. Meaning no – they aren’t very stylish at all. If you’re craving some style while on safari in the Serengeti a good pair of light, breathable shortswork just fine. The Pants: I have the prAna Haley pants and get complimented on them all the time. They are lightweight, dry fast, roll up into capris and fit my bum quite nicely. I would suggest opting for neutral colors while on safari so that they don’t distract the animals. The goal is to blend in while on safari. The Shirt: Lightweight and comfortable shirts are key while on safari. You will most likely be in a game viewer all day so you will want to be comfortable. I like these Champion shirts on Amazon since they are comfortable and dry fast. 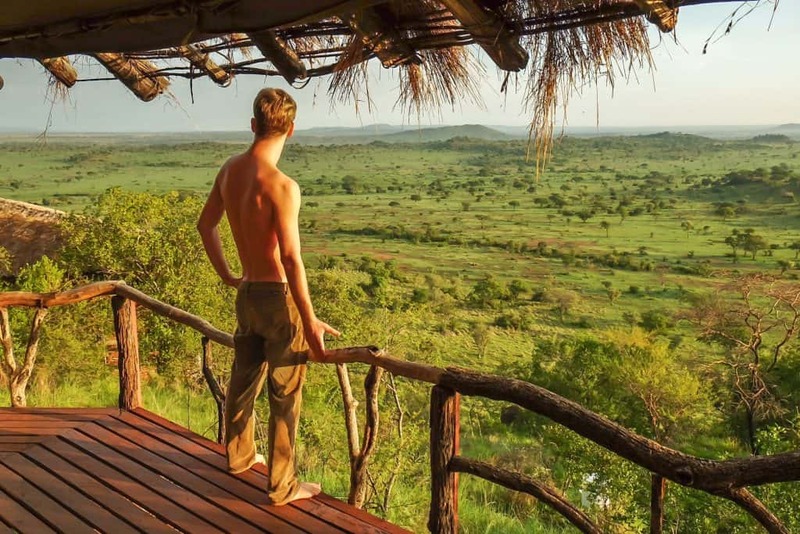 Binoculars: We’ve gotten caught on more than a handful of Southern African safaris without binoculars and let me tell you it’s not ideal. You’ll see loads of lion, elephant, giraffe, and maybe even leopards in the Serengeti (we saw all within our first hour), but chances are they won’t be that close. A good pair of binoculars obviously enhances your viewing pleasure. I like these ones from Bushnellsince they are quality at an affordable price. Shoes: I’m a big fan of letting my feet breathe, and I have to be honest that while on safari in the Serengeti there won’t be a lot of walking. That’s why I prefer to wear my rainbow flip flops whenever I am on safari so that I can be comfortable in the car. When I have to walk around through rough terrain I prefer to wear my Merrell Moab Ventilators for good support and stability. Camera: It’s hard to talk about safari electronics and not mention a camera. Any kind of decent wildlife shots while on safari will require a good camera. iPhones and iPads are great…but definitely not on close ups of animals on safari. I travel with my Fujifilm X-T10 with a200 mm telephoto lens. No, I’m not a wildlife photographer, but I do manage to get close up shots of the most amazing lions and elephants still! Phone: I don’t know if this is a good or bad thing, but I was surprised to find a 3G connection in pockets of the Serengeti park. If you must stay connected to email or Instagram (follow us!) while on safari make sure to bring your phone! Most of the lodges have WiFi connection as well. Adaptor: Tanzania uses the British plug, or the Type G Adaptor. I recommend getting a few off Amazon and checking them off your Serengeti safari packing checklist before getting to Africa as they will be much more affordable and won’t leave you scurrying for a power adaptor at the airport. Head Torch: A head torch is essential in Africa, and the Serengeti is no exception. It gets dark under the beautiful African night sky and you don’t want to step on any creepy crawlers or run into a predator, do you? Lifestraw Go: The water in Tanzania is not safe to drink. We use the Lifestraw Go Waterbottle for those times when we don’t have access to safe drinking water. It filters out 99.9% of bacteria and lasts for 1000 Liters (aka a long time). Insect repellant: Please do yourself a favor and bring insect repellant with you to Africa. 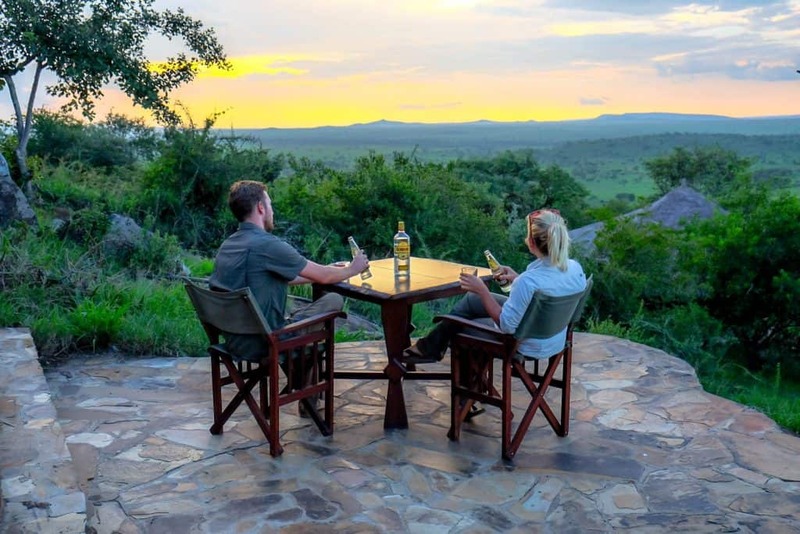 Mosquitos and other insects (hello tsetse fly) can get bad in the Serengeti and covering up and wearing mosquito repellant will make you far less annoyed. There is also that pesky illness called malaria caused by mosquito bites. That’s why adding this to any Serengeti safari packing list is a necessity. Jacket: It may be hot during the day, but as soon as that spectacular African sunset hits the nighttime air sets in. It may get cold at night and on early morning game drives. I travel with a light fleece jacket to keep me warm in this kind of weather. 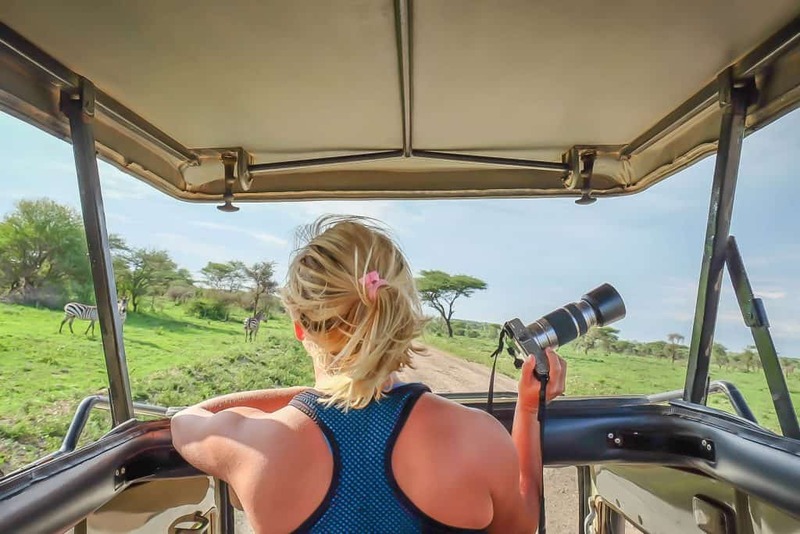 Sports Bra: The roads in the Serengeti are terrible at best – and yes I’m saying that after driving 10 months around Africa. Keep those ladies secure by picking up afew good sports brasbefore you go on safari. Sunglasses: When you’re on safari you spend a lot of time outside and that means plenty of sun exposure. We recommend protecting your eyes and remaining stylish with a nice pair of Sunglasses. Look the Part: Our favorite safari clothes to wear all over Africa. We even have a women’s version! Book Your Tour: There are a plethora of tours you can book via TourRadar. Check out some of the tours on offer. Car Rental in Africa: Although we decided to buy a car to get around Africa we rented a car with Auto Europe for our first two months on the continent.